It is sooo easy and so good for you! It improves your joint health, boosts your immune system, supports hair, skin, & nails...the list goes on. My favorite way to make it? In a slow cooker. See Pamela Salzman’s Blog. I always always always store it in a glass jar, of course. When filling the glass, I never fill it all the way to the top, especially when I plan on freezing it. I always leave room for expanding as it freezes - and let the broth freeze without the top for a while and then cover to keep fresh, which can stay fresh for up to 6 months! I like to use the Smooth Side Ball Jars - but not with the tops they come with as those rust too easily. I buy the ball white plastic lids and swap the metal ones out. 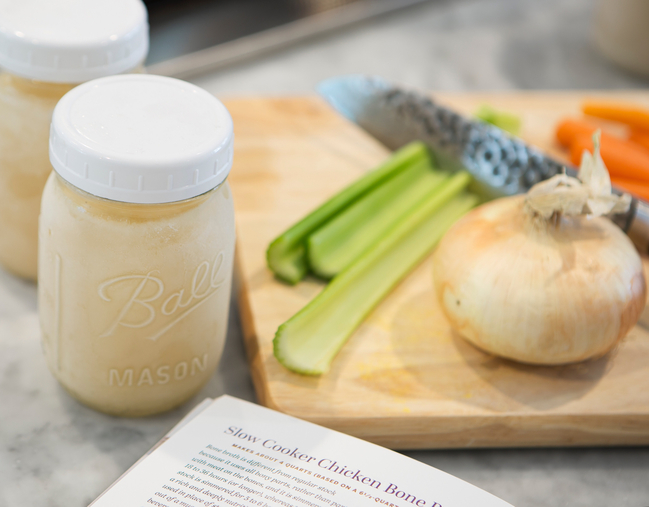 Next time you make bone broth, please share pictures! Would love to hear how this trick works for you.